On 3 August 2015, Mikis Theodorakis, the Greek world famous music composer and Resistance figure, called upon the Greek people – and the peoples of the world – to respect Democracy – the very Democracy, born in Greece some 2500 years ago and given to the world as a set of values for respect for each other, for humanity – for equal rights and for free expression. He referred in particular to the Greek referendum in which the Greek people on 5 July 2015 voted with an overwhelming 61% against the continuation of the economic and financial strangulation of Greece by the infamous troika – the European Central Bank (ECB), the European Commission (EC) and the International Monetary Fund (IMF). Severe austerity imposed during the last 5 years has already caused misery and countless deaths especially among children and elderly, because of deprivation of vital medical services. 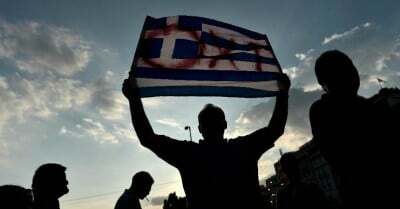 Instead of respecting the vote, the Tsipras Government has ignored it, made a U-turn and accepted even harsher austerity measures for an additional € 86 billion debt, of which not one euro would reach the Greek government for the restauration of its vital social services. Mr. Tsipras’ action is anti-constitutional and illegal. The following text summarizes Mikis Theodorakis’ appeal to stop the Syriza Government from selling out the Greek people’s country and stop the currently – almost in secret – ongoing negotiations with the troika on the modalities of the € 86 billion loan and the details of the new austerity measures – “negotiations” to be concluded by about 20 August 2015. Mr. Theodorakis and his co-signatories want not only the Greek people to wake up, but the whole world to open their eyes, as the financial sledgehammer waged by the bankster mafia knows no scruples, no limits – and may well hit any other country tomorrow.